Banner walls consist of a lightweight frame which literally expand up to create a skeleton frame which then holds the graphic panels in place. Usually these panels are printed to create what looks like a continuous seamless graphic display. All of our Banner wall display stands come in a variety of widths starting from a one cell wide stand up to 6 cells wide. Halogen lights are available to create a superb graphics display stand. The appeal of Banner wall display stands comes from their portability, ease of assembly and great value for money. They can be assembled in minutes and can be packed down for easy transportation. Whatever the size of your exhibition space, our Banner wall stands will create an attractive seamless graphic display to suit your specific display needs. Where can I use a Banner wall stand? 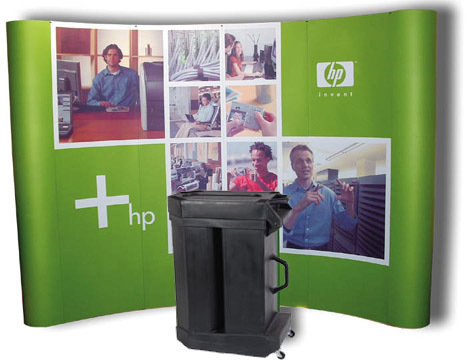 The versatility of Banner wall stands means that they can be used virtually anywhere. They are ideal for use at exhibitions, conferences, training events, sales meetings, reception areas or retail outlets where you want to display a brand or message.